The Xiaomi Mi 4i features a similar 5" Full HD IPS display to the one we saw on the Mi 4. It has 441ppi for pleasantly sharp imagery. Unfortunately, the glass covering the display isn't scratch-resistant. 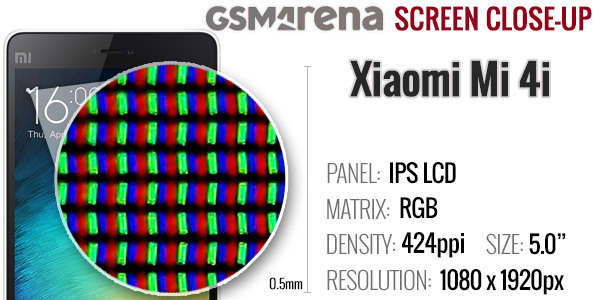 Taking a closer look at it under our digital microscope reveals a standard RGB arrangement of the sub-pixels that make up the Xiaomi Mi 4i LCD panel. 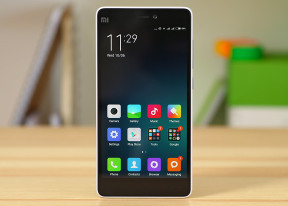 The display on the Xiaomi Mi 4i has a lower maximum brightness level compared to the one on Xiaomi Mi 3, while retaining the same good contrast and colors. Xiaomi is providing options for color temperature and saturation, so you can tweak the display to your liking. The sunlight legibility has been slightly improved and the Xiaomi Mi 4i's screen performs very well outdoors. You will be able to comfortably see what's happening on the screen even on the brightest day. Xiaomi has also included a display tech for boosting the brightness of darker areas of your screen to make them more visible when there's bright light source present. It's similar to what Sony has been doing with its flagships lately only here it works throughout the interface and not just in the gallery. The Xiaomi Mi 4i supports 6 LTE bands and you can tap to an LTE network on either SIM, but the other will default to a GSM band. The Mi 4i also offers quad-band GSM connectivity and tri-band 3G connectivity with HSPA support. The rest of the connectivity features include dual-band Wi-Fi a/b/g/n/ac support and Wi-Fi Direct. There is also support for Bluetooth 4.1, GPS and GLONASS, plus an FM radio. A microUSB 2.0 port handles charging and data connections. Media transfer mode is supported for accessing the phone's built-in memory over a USB connection. The microUSB port also supports USB On-the-go for connecting USB peripherals such as pen drives, keyboards or real USB hard drives. Xiaomi has put a 3,120mAh battery inside the Mi 4i, a solid capacity for a 5" device. 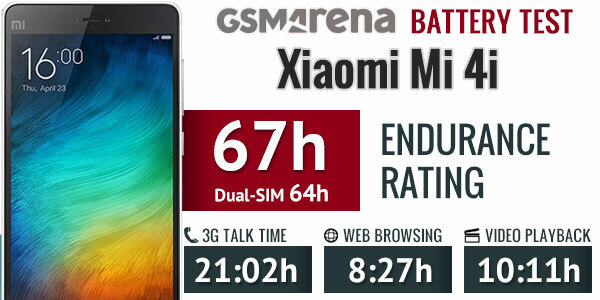 In our battery test the Xiaomi Mi 4i scored a 64h rating, which means you can count on a little over two and a half days if you do an hour each of calling, browsing and video playback a day. Opting for using the device with just one SIM card active, you can squeeze a little more out of the battery. The single-SIM endurance rating is 67 hours.